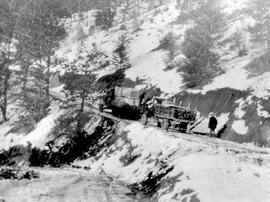 Bert Williams' Pack Train In Wolverine Pass Between Gun Creek And Bridge River. Two trucks heading up snowy road. Cinching up a pack horse at Cayuse Creek during the exploratory survey for the V.W.N. & Yukon Railway. Climber carrying in supplies, Garibaldi; box 36. Packhorses on the trail; Garibaldi; box 36. 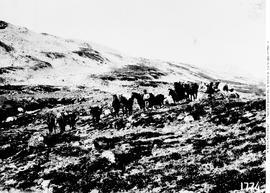 Perkins' pack train at Britannia Mine. Ray Elliot on the Pemberton Trail.